With the June months pressing closer, the Spring TV and OAV season starts to draw to a close in Japan. Most of the shows you have just started to enjoy are ending too soon, and the shows you've loved to hate can't end quickly enough. With that, the new Summer season rears its head during the rainy months and starts to gnaw leaves off the Tree of Life. Some of these shows have already been featured in the "Maker Oudan" catalog featured before. Each title is listed with its genre, as classified by Wikipedia. 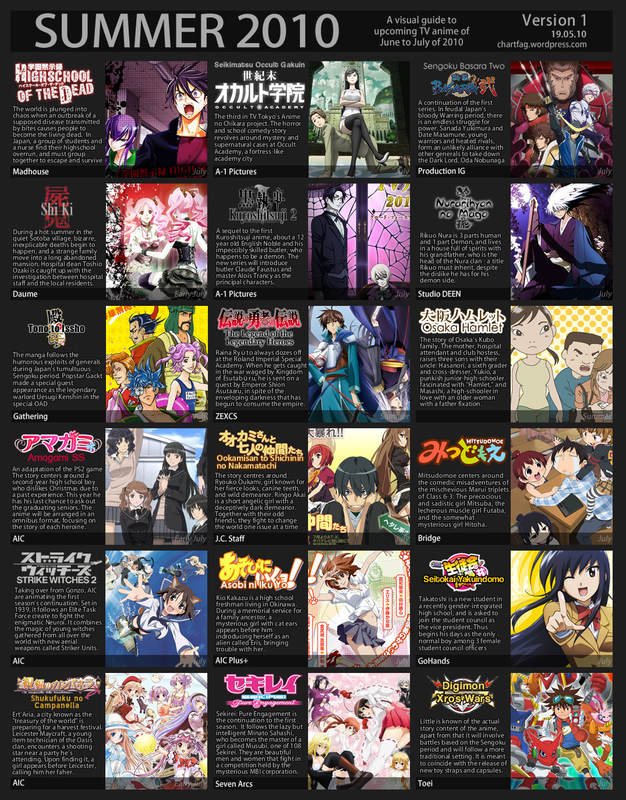 To put it bluntly, horror wants to dominate the season (Highschool of the Dead, Shiki), but the romantic comedy genre (Mitsudomoe, Asobi ni Iku Yo!, Ôkami-san) doesn't want to let go of its grip on TV. Sequels are also surprisingly high on the list, as Digimon is likely going to capitalize on the end of the Pokemon TV franchise. Also high on the list? GACKT. Yes, the flamboyant soloist will be voicing characters in both Shi Ki and Tono to Issho, which might result in spikes in popularity. Sadly, nothing really seems to jump out and grab my attention, but that could change once the TV season's cycle is set in motion. Best guess? Nurarihyon no Mago captures the most attention due to its attachment to the Shonen Jump franchise, just in time for Bakuman to light the airwaves on fire in the Autumn cycle.